From the minute I found out I was pregnant (okay even before), I knew a solid wood and as eco-friendly as possible crib was on my list. It was the number one nursery priority along with an organic mattress. I understand that I cannot protect my baby from every little chemical in this world, but I felt like the baby’s sleep zone was a good start. In the world of eco-friendly vs. non-eco-friendly, it seems as though you have to be one or the other. I prefer to take the stance of choosing what is important to me and doing the best I can. Repeat, I do the best I can. I love DwellStudio in general but I particularly love their baby lines. Mmmm. Anyway, I started our crib search on the good old internets, world wide webs. One thing I learned about baby things is that choosing them is about 90% research and about 10% walking into a store. So I googled and found various articles about what to look for in a crib. One consistent theme was solid hardwood. MDF and particle boards are often held together with toxic glues. The glues can omit fumes over time and considering that babies spend a good amount of their first, impressionable years sleeping, I’d rather not have those fumes. I made solid wood the #1 priority in finding a crib and started with that. I found myself becoming extremely frustrated that many brands did not blatantly say whether their cribs were 100% solid wood or not. Of course there’s Pottery Barn, Restoration Hardware and Land of Nod (Crate & Barrel’s kid store) that boast solid wood furniture, but they cost $700+ for a crib. I heard that DaVinci cribs sold by Babies R Us were 100% solid wood, but I couldn’t find it stated on their website. You would think that such a selling point would be screamed from the rooftops “HEY NEUROTIC NEW PARENT, THIS CRIB IS SOLID WOOD!” Though I did catch many brands use terms like “solid wood with MDF parts”, which I took as a no thanks. Needless to say, crib hunting has been one of the more tedious of the baby product huntings I have taken on in the past several weeks. Oh yeah, another the thing about finding a healthy (or least toxic) crib…it’s still a piece of furniture that you have to like, right? Many of the eco-friendly cribs are unfinished since paints and stains typically have some VOCs. 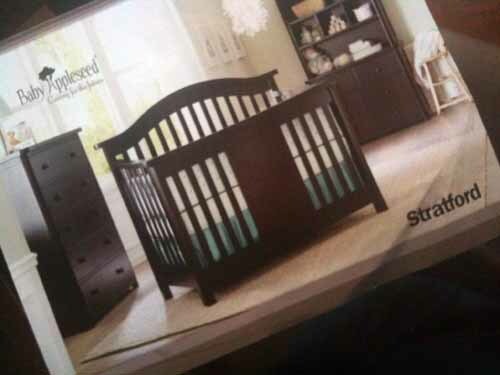 But I don’t want an unfinished crib, I want a dark stained crib. So here I was, like a balancing scale, weighing style, safety and cost. I started reading some threads on eco-friendly message boards and found some brands. I believe I googled “DaVinci cribs solid wood?” to find a discussion that mentioned that DaVinci was made by Million Dollar Baby. BAM! Starting point. So I went to the Million Dollar Baby website. Sure enough, solid wood, non-toxic finishes and I loved the Annabelle crib…. 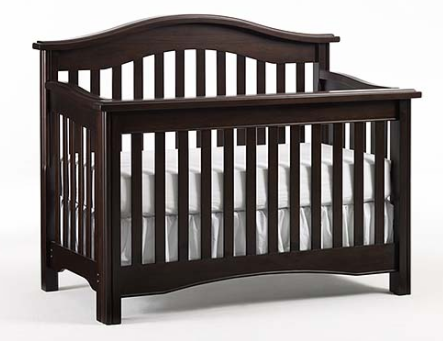 I googled the name of the crib and found that it was retailing for about $350… yay affordable! So I hunted down a semi-local retailer… okay it was in Delaware. Which sounds far but it’s really less than an hour from us since we live fairly south these days. I figured during one of the days between Christmas and New Years we could take a nice little ride there so I could pet the Annabelle crib in person. Nice little ride turned into pouring rain, traffic, a nasty soda from Wendy’s which left me dying of thirst and a whole lot of disappointment. The store was not as appealing as it seemed and guess what? They had just taken the Annabelle crib off the floor that week. I literally walked around the store for about an hour wanting to like another crib but not a single one was my style. Not. One. I wouldn’t say the entire experience was a waste though. From the sales person, I learned that every single crib on their floor was solid wood. Some were around $300 and some were more than $1,000. There was one I was so-so about and figured if I found nothing else, it would work. I took some flyers with some brands as further jumping off points as to which companies used solid wood in their cribs. Then we spotted this one crib that caught our eye because of the way it looked. It was traditional, yet modern. When we looked at the tag we saw that it was made out of 100% solid wood. The company also plants 10 trees in a location of your choice for each crib purchased. Hello eco-friendly! And the best part? It was $299. It’s the Stratford convertible crib by Baby Appleseed (yes, that’s a crappy iPhone picture of the info sheet I took from the store). We wanted a dark wood crib, but not cherry colored. Originally, I wanted something with solid panels on the back or sides but I decided I’d rather have something convertible, which solid panels on the sides are not. I initially liked very straight lined cribs, but as I looked at them in person and realized that we would be doing very straight lined molding around the room, I warmed up to the idea of a curved back. It seemed that this crib had the best of everything—slightly curved back, but straight front and legs, convertible yet solid panel in the front. Safe, eco-friendly, stylish, affordable? Sold. I don’t even have kids or plan to anytime soon and I read the whole thing, lol! Our boutique only carries all natural, organic, and eco-friendly baby products. When we had our daughter, I instinctively felt the overwhelming concern for her well-being and overall health. With that concern came a lot of research into eco-friendly cribs made with natural wood, organic crib bedding, natural baby clothing, and all natural baby bath products; we started going green! That’s when we decided we wanted to offer like minded parents a place where they could shop with peace of mind for their precious babies. I hope you like our stuff! Same thing happened to me when I had my son, great to see that you’ve put so many amazing products in one place! I love the modern designs and high fashion feel. Thanks! we update the site with news products frequently and would love your feedback and suggestions. 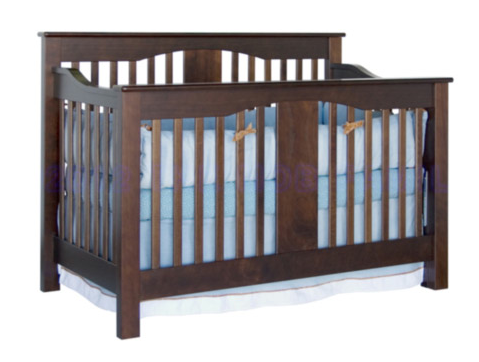 We carry the Simply Affordable Forever line of solid wood, American made, cribs and bassinets. The cribs are made in New York and have no mdf, plywood or veneers; just domestic hardwood. They are finiished with pure linseed oil. They are simply designed in the Amish tradition to last forever. I have a whole nursery to put together,what are you favorite products? Rebecca, can you give us an update on the crib? I am leaning towards getting this one for many of the same reasons you did, but I wanted to hear how it’s held up. Have you converted it yet? It’s really hard to find reviews online! I also just want to say thanks. Since I found out I was pregnant I’ve been doing the same frustrating search. I think we are going with this crib too after finding your post. It should not be this hard to create a truly non toxic nursery!! Thank you for posting this! Solid wood is my top priority as well! I think I am going with Bonavita- but I read it is solid wood and wood veneers. The whole process is frustrating! I’ve no knowledge of programming but I was hoping to start my own blog in the near future. Thank you for another informative blog site. The place else might I get that type of information printed in a real excellent manner? I’ve a challenge that we are right now implementing, i are already at the peek away to get similarly info. If you want to get a great deal from this post then you have to apply these strategies to your won webpage. website taste is perfect, the articles is truly nice : D.
It’s actually a nice and useful piece of information. I am satisfied that you simply shared this useful information with us. regarding cultureand entirely defined, keep it up all the time. May I just say what a comfort to uncover a person that actually knows what they are talking about on the internet. I’m slightly sure I will be informed many new stuff right here! content, but this web site gives quality based posts. Thank you a lot for sharing this with all folks you really understand what you are talking about! Hi, everything is going sound here and ofcourse every one is sharing information, that’s in fact excellent, keep up writing. to light and make it important. A lot more people must read this and understand this side of the story. you might be a great author. I will make certain to bookmark your blog and may come back someday. for to say regarding this paragraph, in my view its in fact awesome for me. every one is sharing facts, that’s really excellent, keep up writing. Very good blog you have here but I was curious if you knew of any discussion boards that cover the same topics discussed in this article? Can I simply just say what a comfort to uncover somebody that actually understands what they are talking about online. make it important. More and more people need to look at this and understand this side of your story. you book-marked to check out new information in your website.